- This is a must-see from TOS. 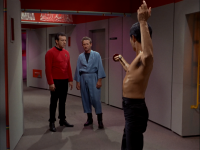 The disease the crew contracts in this episode will recur later in TNG: The Naked Now and the magic time travel formula Spock discovers will also recur several times during TOS. - This episode establishes that Spock's mother was human and Spock's father was Vulcan. - This episode establishes that the ship's engines are powered by a matter-antimatter reaction. 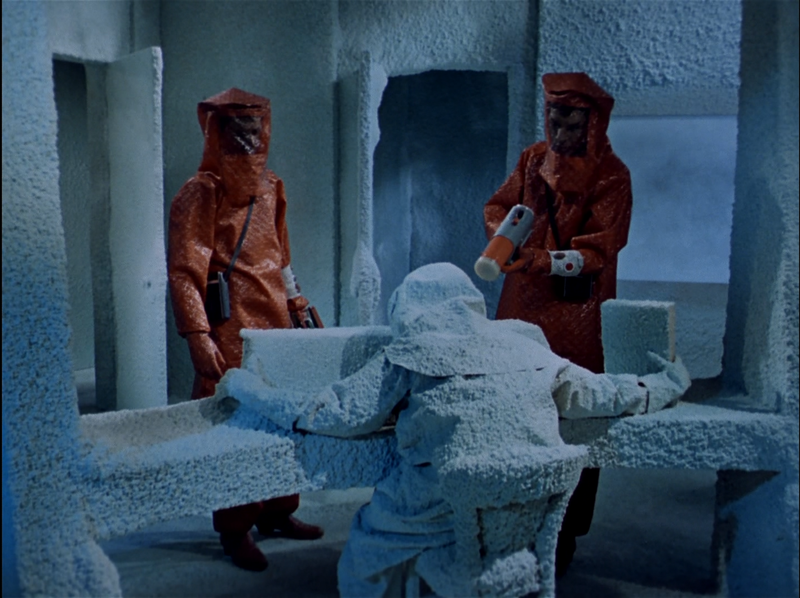 - This episode was nominated for the 1967 Hugo Award for Best Dramatic Presentation. 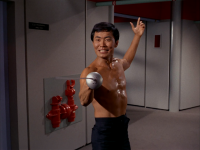 - Sulu rampaging through the Enterprise with a fencing sword. - Spock using some sort of neck pinch to render Sulu unconscious. - Nurse Christine Chapel trying to seduce Spock. - Spock losing his emotional control after being infected by Nurse Chapel. - Scotty: "I can't change the laws of physics!" - Kirk becoming infected while Spock regains his control. The Naked Time is an effective comedy story mixed with a touching subplot regarding Chapel's unrequited love for Spock whom does not return her affection. He ignores her affection for him not because he does not feel the same for her, but because he feels he is ethically obligated to suppress those feelings because of his Vulcan heritage. 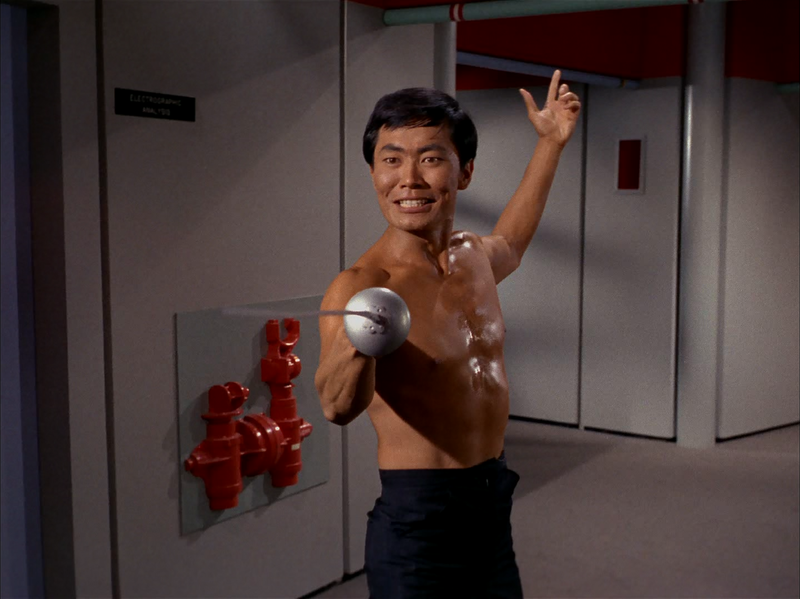 The other side of the story is full of fun moments such as Sulu rampaging through the ship with a rapier and random members of the crew exhibiting generally amusing drunken disorderly conduct. Unfortunately, this is all predicated on an exceptionally stupid mistake by the crewman who beamed down with Spock in the opening scenes. They're in a hazmat situation and the damn crewman takes off part of his protective suit in the middle of the investigation which is trying to determine what inexplicably killed that whole colony full of scientists! This is a degree of reckless incompetence that is so high that it makes it hard to be sympathetic to our heroes' plight. Then there's the painfully irrelevant ending. To save the ship from crashing down onto the planet, Spock invents... time travel? Seriously? Worse yet, once the ship is saved, Kirk just sort of sits there and basically says, "gee golly, that's an interesting accidental discovery. We might have to use that deliberately some time." His casual indifference to the magnitude of such a discovery would be like someone from ancient Rome seeing an airplane for the first time and shrugging, as if there was little significance to the existence of such technology. Those issues aside though, the episode is highly enjoyable with very effective comedy. The remastered episode shows a brightly lit planet. It also appears to be lit on every side (no nightime). Not only is this unrealistic, Spock mentions that the star is that solar system had dimmed out, so if anything the planet should be very dark. This is also the first instance I recall that we find out that Spock's mother is human. 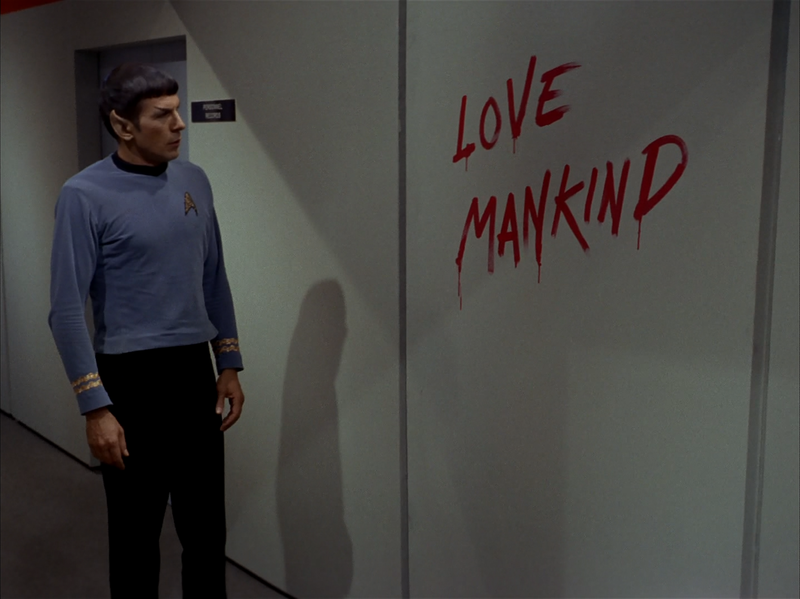 In the previous episode, Spock says that he has human ancestors. So now we know Spock is half human and his mother lives with his father on Vulcan. I agree that at the beginning of the episode, it felt like the ship is crewed by idiots. And the ending is beyond belief, I just blot it from my mind. However, the internal portion of the episode is cool. In particular, I thought Kevin O'Reilly was funny, and Nurse Chapel is effective. - After rewatching the episode, I have a theory that the red suits they are wearing are cold weather survival suits, not hazmat suits. That would explain why they aren't sealed under the chin. This would make the idiot crewman's actions seem a bit more believable. - It seems like TOS was often trying to convey the idea that the Enterprise was crewed, not by the best and brightest of the Federation, but a bunch of average joes attracted by the recruiting posters. Hence the prevalence of foolish actions by the crewmembers. - I don't think Kirk was indifferent to the magnitude of the discovery. I think he was trying to make light of the situation as a way to exert leadership. He wasn't going to make any more use of the time warp right at that moment, so he might as well try to snap everyone back to reality and focus their minds on the mundane tasks at hand. I agree with the review of “The Naked Time.” But I would still rate it higher than a Five. Despite it’s weaknesses this episode has always been one of my favorites. I never get tire of watching it. 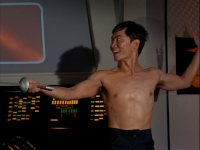 My problem with reviews of the first year of Star Trek TOS is my objectivity. When Star Trek first came out I was 15 years old and the first season made a big impression on me that has never waned over the years. In The Naked Time there are so many, many scenes that stand out for me. At the top of this list is the scene with Nimoy’s performance of Spock contracting the disease. 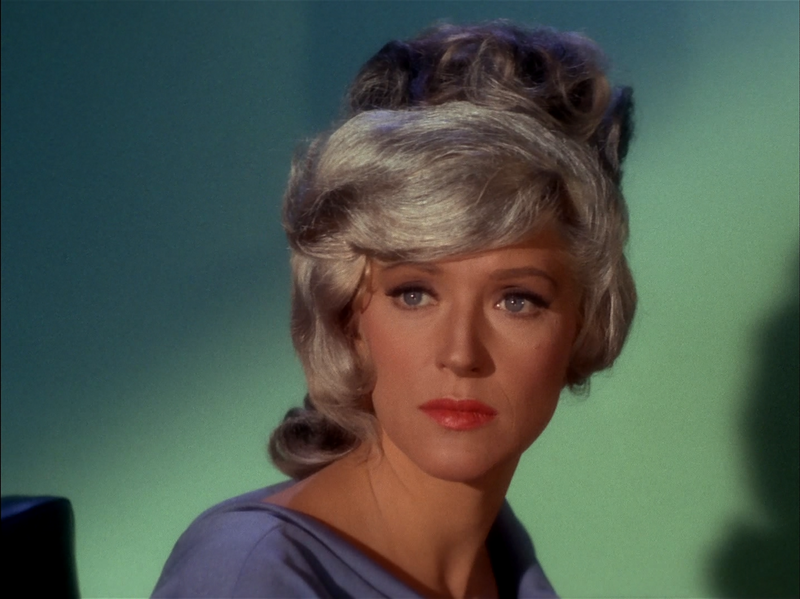 Spock's scene with Nurse Chapel is moving and the scene in the briefing room is wonderful. That scene was shot in one take! An Amazing performance by Nimoy! Another were the scenes with Lt. Kevin Riley played by Bruce Hyde. I adored the character of Kevin Riley and I wish he had been made a regular on the show. He was only in two episodes and I always felt that was a real shame. Riley seem like a real person to me, and someone I could relate to in a way that is hard to explain. Sulu, Uhura, Chapel and Scotty all had important roles in this episode and that was so great. But I had a problem with Scotty using the Phaser to burn thu the panel to get to the switch to open the door to the engine room manually. Why didn't Scotty just use the Phaser to blast a hole though the engine rool door itself? They could have been in the engine room in seconds! Also I totally agree with the criticism of the ending. That always bothered me too. If Riley had indeed turned the engines off, why didn’t the Enterprise immediately fall into the atmosphere and burn up? I know the ending was added for dramatic effect, but I feel it could have been done in a more believable way. I try to gloss over the ending whenever I watch this episode. LOL. Actually, Mike, a better question would be, "Why would it fall into the atmosphere and burn up at all?" The Enterprise is in orbit around that planet, and requires no power to stay in orbit. It takes years for satellite orbits to decay, and that is from low Earth orbit. You are absolutely correct Old Fat Trekkie! 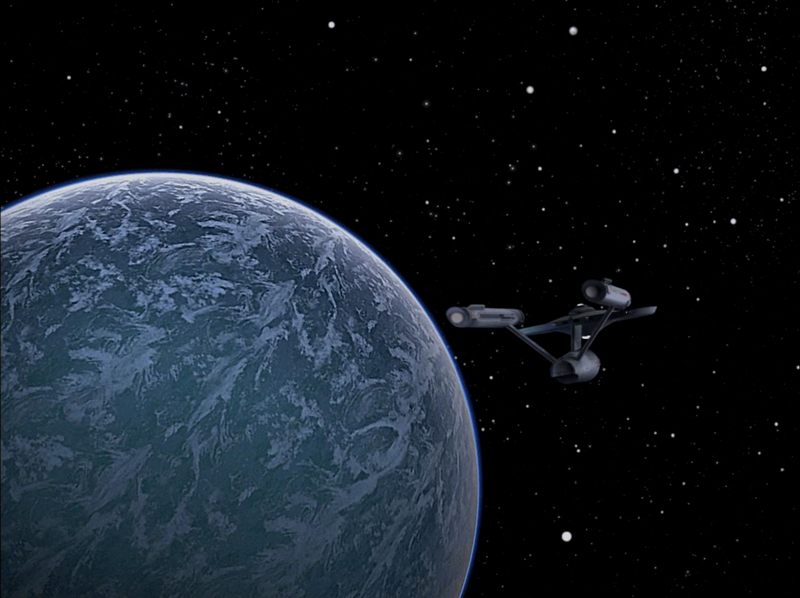 We don't exactly know what effect the so-called "break up of the planet" would have had on the Enterprise and it's orbit, but it is clear from the episode that the planet had little or no atmosphere to speed up the orbit decay. So Scotty could have had his "30 mintues" to restart the engines. Best line: "Take D'Artagnan here to sickbay." I gave this one a '5'. The episode was entertaining and well paced, but it asked the viewer to believe too many 'whoppers' along the way. For example, Riley just clears out the engine room that easily? One of the few places on the ship so sensitive that abandoning your post might be a courtmarshall offense, and the whole engine room crew just buggers off on the word of a man who is visibly intoxicated? 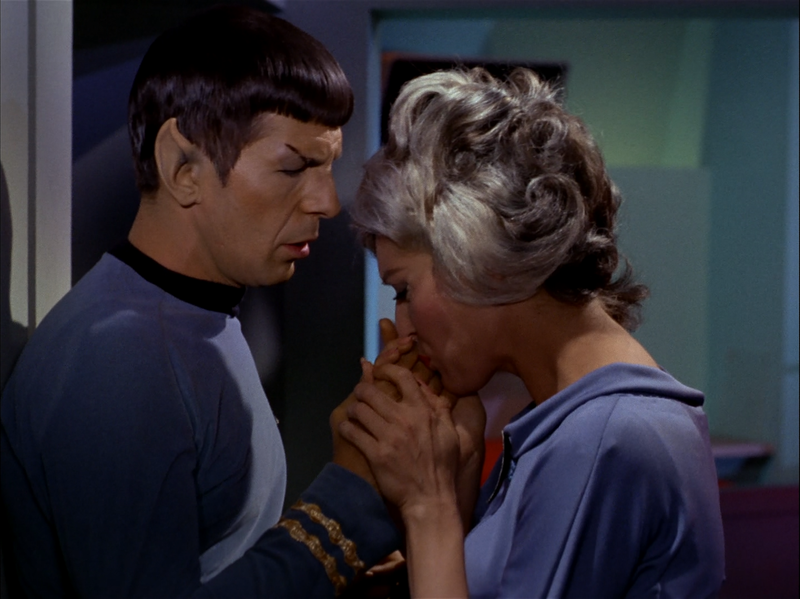 Kethinov wrote: "The Naked Time is an effective comedy story mixed with a touching subplot regarding Chapel's unrequited love for Spock whom does not return her affection. He ignores her affection for him not because he does not feel the same for her, but because he feels he is ethically obligated to suppress those feelings because of his Vulcan heritage." I'm not sure it's entirely because of his Vulcan heritage, although that's an element that's always at play with Spock. We have to remember that Spock's engaged to T'Pring at this time--and Chapel's engaged to Korby (although we don't know if Spock knows that). Not only would Spock suppress any attraction he might have to Christine, he would be honor-bound not to follow up on it because of his bond with T'Pring. 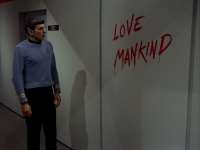 I have a theory that a combination of events in Season 1 are responsible for provoking the onset of Spock's pon farr at the beginning of Season 2. There's this episode, with the aggressive pass by Christine, Mudd's Women (watch Spock's face--no way is he unaffected by those women! ), and This Side of Paradise. An episode that's more fun than sensible. Sorry, but it has a lot of problems. The dead woman at the beginning looks like a mannequin. I think it _was_ a mannequin. When we see the red fluid jump to Joe Tormolen's hand, it's obviously just dripping down due to gravity with the camera rotated. And we never hear anything about this fluid again. All we get is McCoy saying, "It's water. Somehow on this planet, water's changed to a complex chain of molecules." So what if it has? How does it get into the bloodstream? And it must somehow convert water in the bloodstream to this new form and then emerge in sweat. Yes, complex water that's carried by a red fluid that defies gravity to infect people via perspiration into the bloodstream. Whatever. Breakup of a planet? Shrinking? Losing mass? That violates conservation of energy (mass being a form of energy), probably the firmest law of physics we know of. Patently ridiculous. Even worse is the care they need to avoid spiraling into the planet. If the mass goes down, so does gravity, even if you intentionally spiral in to maintain the same altitude. So where's the danger? The one saving grace about this is when Kirk orders a hyperbolic orbit, which is real thing: an open-ended orbit. And why does the planet moving up in the view screen mean the ship is getting closer to the planet? How do you make up stuff like this? 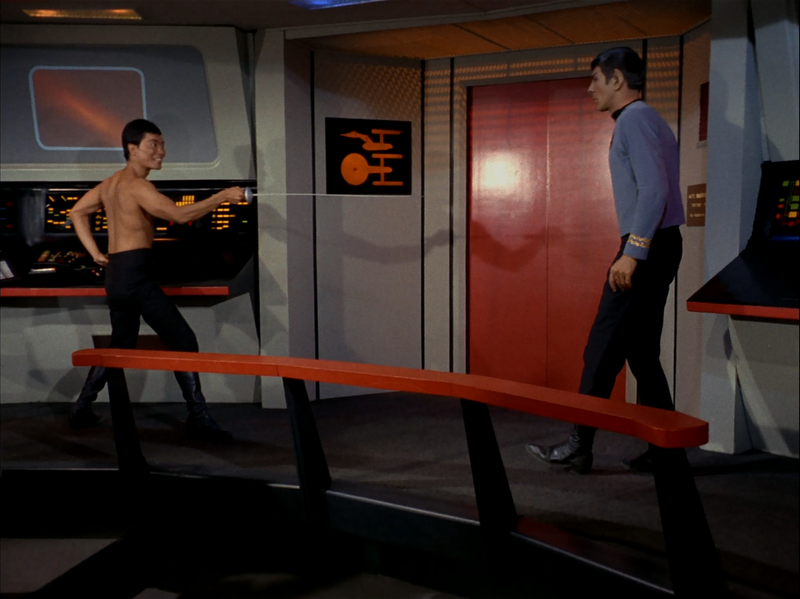 Spock to McCoy: "And as for my anatomy being different from yours, I am delighted." Delight is an emotion, no? 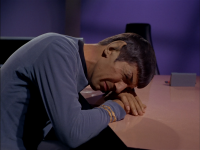 So much for normal Spock being devoid of emotions. And this is not the only such incident. Well, to be fair, in this episode, he says "he is in control of his emotions". In fact, even as a kid, that was what fascinated me so much about Spock. He was IN CONTROL of his emotions, not emotionless. And, as someone else mentioned, Nimoy does a great scene losing this control and the ability to perform simple arithmetic. I like the rattling sound we hear whenever a character is rubbing the infected perspiration on their hands. It works very well. Rand: "Spectral analysis tape, sir." Spock plays the "tape" and it's just a video. Death by a plain eating knife? If you can keep it straight while using sufficient force, maybe. A respirator without an oxygen supply? 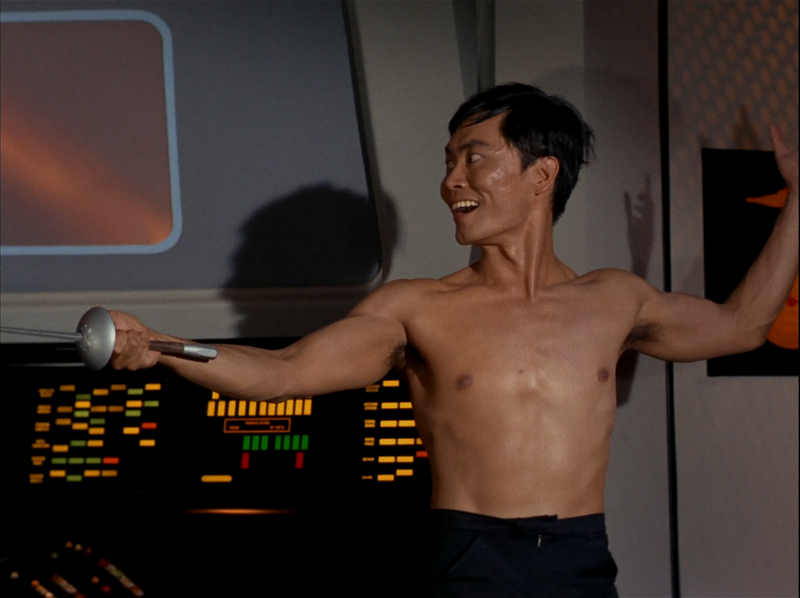 Sulu with the sword is great! Is there any other episode where Kirk can't leave the bridge because there's no turbo car ready? Not only did Reilly get everyone out of engineering; he also, despite being punch drunk, took complete control of the ship without a single slipup! Yep, they should have phasered the door to engineering. I suppose it's a bit risky, though. You don't want anything else to get accidentally vaporized! I mean, how large an area would disappear? Can you isolate it to just the door? What if the door vaporizes before you stop the phaser? Won't the phaser beam then hit what's behind it? This never seems to be a problem on this show, except here. When the ship suddenly tilts at about 26:20, Nurse Chapel and McCoy fall the wrong way! I believe we get to see Mr. Spock using a circular slide rule! Please. Laughing man with the red paint is pretty funny. 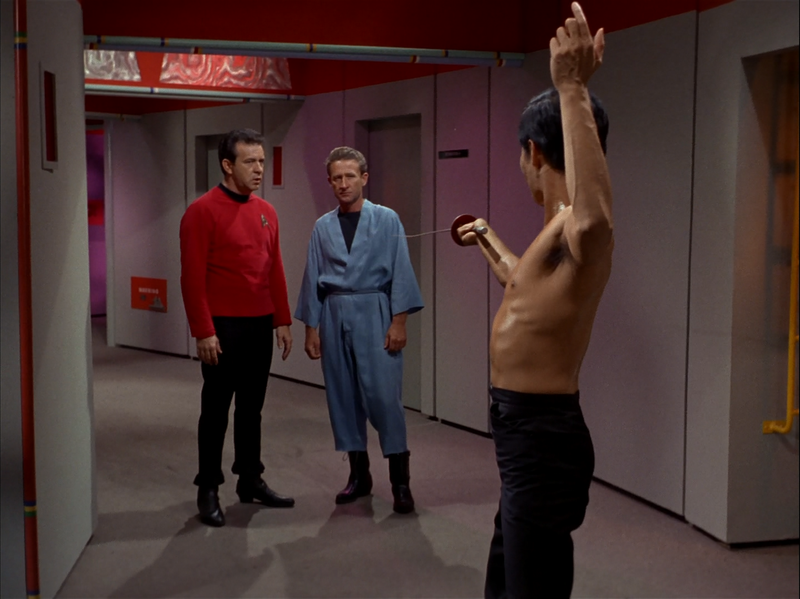 Time is wasting when Scotty puts down his torch and argues with Spock about time and safety factors and such. It's amazing how all the bridge crew know how to work the helm and navigation. Uhura over the intercom: "Entering planet's outer atmosphere, sir." She says this in a totally calm manner -- as if it were just informational. I believe she does stuff like this in "The Menagerie", too. 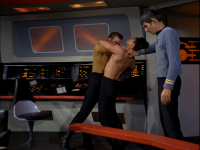 So a few violent slaps in the face cures Spock? 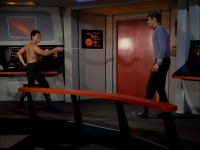 This is (I think) the only episode where McCoy can't inject hypo right through a shirt. He has to tear Kirk's uniform to bare his shoulder to give him the shot. Whereas in "The Tholian Web" he injects Jim with hypo right through his space suit! OK, the ending. Hyperbolic orbit. That's the only scientifically sensible thing in this entire episode. I don't understand why the ending upsets some viewers. I don't see how it's "irrelevant". They save themselves by "imploding the engines", whatever that means. It's apparently quite exotic physics-wise, so I think it's quite reasonable that something extraordinary should happen after trying an untested formula that has a 1 in 10,000 chance based on known physics. It's basically a side effect, but a big one. I do, however, still find time travel totally absurd. But it's still a fun scene. Speaking of time travel: Why is the chronometer going backwards? It must be something more than a normal clock mechanism that just runs. It must somehow tap into spacetime itself; otherwise, it would appear to run forward just as everything else does. And it's mechanical! It's just a regular odometer. A motor running some plastic wheels. Why should that go backward just because someone painted some time numbers on it? How does it know that time on the ship is going backward compared to time outside the ship? As a quick aside, it being just a mechanical device at least makes it consistent with the rocker switches you see on many of the control panels throughout the ship. Now, since they went back 71 hours in time, they'll be in three places at once for that 71-hour period: One going forward "the first time", one going backwards, and then again going forwards "the second time". And at the moment they switch from going back in time to forward in time, they must split into two. And later, one of them, the one that was also going backwards in time, will merge with the first one and disappear. Sounds ridiculous? It is. But draw it on a piece of paper with the a vertical time axis. I'll try below, but it would look best in a fixed-width font. The t line is the time axis, with later times above earlier times; i.e., time goes forward as you go in the upwards direction. OK, from A to B they go through all the trouble with the complex water. At B they escape from the planet (and hence a change in x), and begin to go back in time. At C they reverse the engines and start going forward in time. So what does this look like to an external observer? The observer will see two ships, one at A and the other at C. Then the one at C will split in two, with the inhabitants going backwards in the B to C branch, and forwards in the C to D branch. And they'll be overlapping each other until they fully separate as they both "depart" from C! At B, two ships will merge and disappear, again with one crew going forward and the other going backward, overlapping each other into oblivion. After this, the ship at D is all that remains, with normal time flow resumed. This is what you have to believe to believe the time travel exhibited in this episode. Yes, it's plain ludicrous. And it violates conservation of energy. Oh, and you have to explain why this effect is limited to the ship, as it comes from the engines. Is it transmitted through solids? Perhaps it has a limited range with a sharp cutoff. That would do it. A similar thing does happen with electrons scattering off of photons, sort of. But you get antiparticles annihilating each other at B, which results in an outgoing photon going upwards past B, and an incoming photon turning into an electron-positron pair at C. It turns out that a positron going forward in time is mathematically equivalent to an electron going backwards in time! This is clearly a no-go for macroscopic objects! Plus, in the Star Trek version, there is nothing corresponding to the incoming and outgoing photons. Orion Pimpdaddy says the lighting on the planet in the remastered version is unrealistic. Not really a surprise. I think the remastered effects are overrated and often actually worse. Take "The Doomsday Machine", for example. Engines visible on the rear view screen? C'mon. The machine slowly tilting downward as it dies? Please. The original got it right. To Abigail: Yes, McCoy discovered the antidote before Kirk found Spock sobbing in the briefing room. But he told his lab tech, who was off in la-la land, not the bridge. And on top of that, they need time to make the stuff. I just re-watched this for the first time in a long time and while I agree that the technical problems detract to some degree I think the character development far outweighs any other issues. Here we have the first appearance of Christine Chapel, along with her love for Spock; a significant step forward in the dynamic between Kirk, Spock, & McCoy - especially in the razzing Bones gives Spock over his green blood and bizarre vital signs; significant insight into the character of Sulu - some of which never really gets revisited until the Abrams reboots; Kirk pining over Rand; Uhura playing off everyone; and a fantastic performance by Bruce Hyde as the sadly underused Riley. This is also *the* day that Kirk admits to himself that he is in love (above all) to the ship - The Enterprise - that he will never let go. This plays out through the series and the movies. The emotional and character content of this episode far outweighs any other issues it may have and elevates this episode to at least an 8 for me.